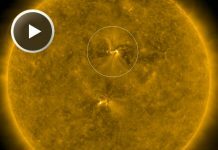 A coronal mass ejection, or CME, surged off the side of the sun on May 9, 2014, and NASA’s newest solar observatory caught it in extraordinary detail. 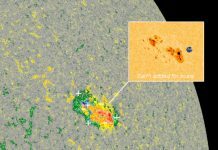 This was the first CME observed by the Interface Region Imaging Spectrograph, or IRIS, which launched in June 2013 to peer into the lowest levels of the sun’s atmosphere with better resolution than ever before. 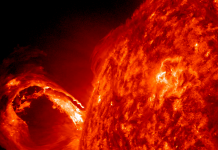 Watch the movie to see how a curtain of solar material erupts outward at speeds of 1.5 million miles per hour. And don’t forget it is five Earth’s wide and about seven and a half Earth’s tall.